Since I’m just finishing up (and moving out of) the first house I was intimately involved in building from the ground up, it seemed like an appropriate time to put together a high-level overview of the different stages of the building process. It’s not a compressive step-by-step plan, but for anyone trying to wrap their head around some of the basics of the building process, this is a great place to start. It’s easy to think the building process starts with things like foundations and walls — hey, I get as excited as anyone about digging a bigass hole in the ground– but the truth is that almost as much work goes into the “pre-building” stages as actually nailing things together. Here are the things to know about it. Know the zoning of the land, topography, and the location of the corners of the property to determine setbacks and buildable areas. For country folk, make sure you’re clear for a well and septic, while city dwellers will need to make sure they have access to public utilities. If there’s an existing house on the property, make sure you know where the current utilities are located– trust me, the sound of a punctured gas line is something nobody ever wants to hear. Once the house plans are done, the exterior walls need to be staked to prepare for excavation. More information on building plans and getting permits (you’ll definitely need one of those) can be found here. The actual “building” portion of the project starts with the foundation, and all foundations will require some excavation. This means heavy equipment, big piles of dirt, and one very awesome hole in the ground. This should probably only be attempted by professionals using an excavator or backhoe. The footings are the foundation of the foundation. They are the lowest part of the structure and carry the entire load of the house. 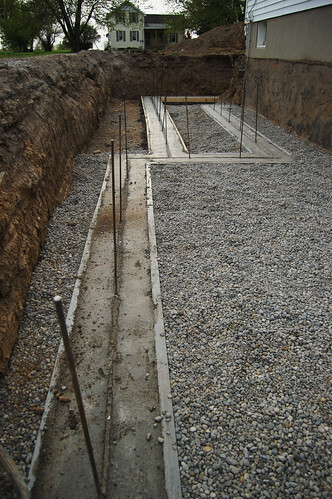 Footings are always located below the frost line, approximately 4′ deep. 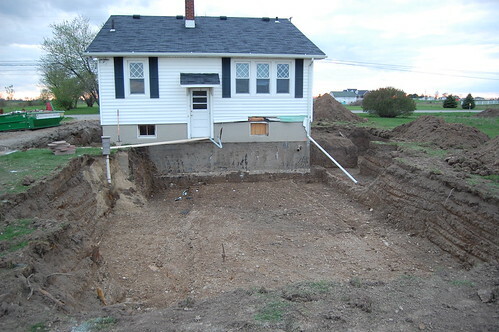 In areas that get plenty of rainfall–hello Southern Michigan–footings should have drain tile installed to remove water from around the foundation. The foundation sits on top of the footings and carries the support for the actual building structure. This is where everything can go right or wrong as far as your entire house being level and plumb. 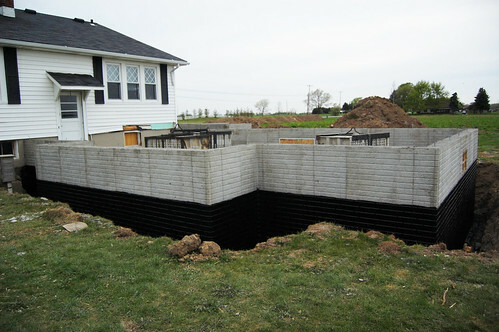 Common types of foundations include full basements, crawl spaces, and slabs. Foundations are most commonly constructed out of poured walls or concrete block. Any part of a foundation that is below-grade should be sealed with a waterproofing agent. All foundations should include anchor bolts that will tie the framing structure into the foundation. After the foundation is finished, cured, and waterproofed, the area around it should be backfilled. For more detailed information on footings and foundations see this post. Personally, when I think of “framing” I think of putting up walls, but the truth is, after the foundation is done, the first thing that is framed is the floor. It closes off the foundation and creates a nice level workspace for framing the walls. The floor is made up of a number of 2x dimensional lumber, 16″ on-center. Girders are metal I-beams, or 3 pieces of 2x face nailed together that rest on the foundation walls, and usually have beams supporting the middle. Floor joists typically rest on the sill plate and one end and girder beam at other. There are many rules and code restrictions relating to notching and hole-drilling to accommodate utilities (electrical, plumbing, HVAC). The rim joists are attached the floor joists by end nailing and the floor joists are secured to the sill plate by toenaling with 3 nails. Floor sheathing or “subfloor” is attached to the floor joist system and is a base for all floor materials. 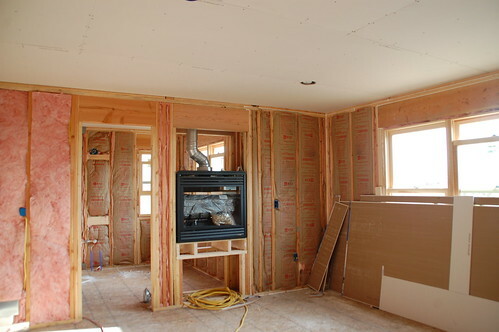 Floor sheathing is usually plywood or OSB (5/8″ or 3/4″ thick). 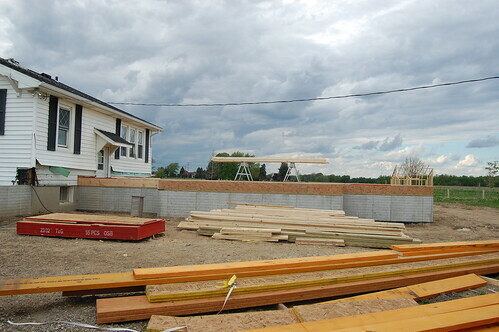 Floor sheathing is laid so the maximum number of joists come in contact with the sheet and no two rows next to each other are laid in the same pattern. A 1/8″ gap is left between sheets for expansion. I like to think of the “frame” of the wall as the thing thing that holds up drywall (or sheathing, if you’re on the outside). 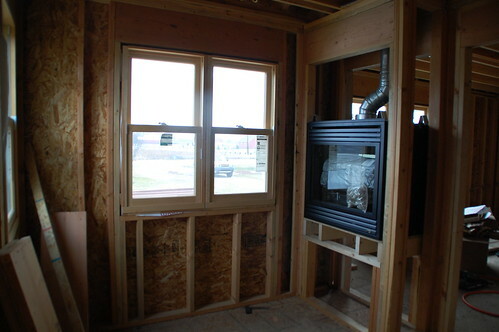 Getting the wall framing right means you have to consider how the materials that will finish it will be fastened to it, and that the weight of the structure is supported vertically– which means that the weight of the roof is transferred through the walls to the beams in the foundation, and that openings for doors and windows are properly supported. 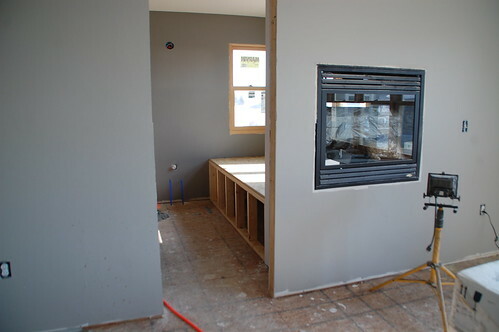 This is started after the floor sheathing is done, which provides a perfectly flat surface for laying out wall units. Wall units are assembled on the ground and then raised into place and secured with temporary braces. Sheathing may or may not be on the walls at this point. 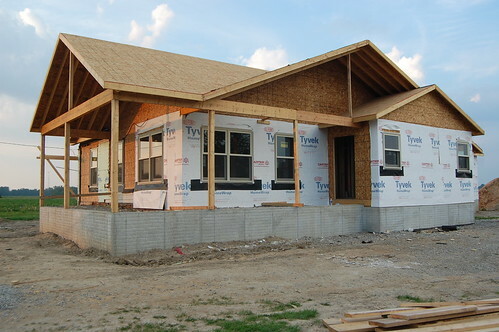 Wall sheathing adds structural integrity to the house and is commonly 1/2″ OSB or plywood. Like floor sheathing, there should be a 1/8″ gab between pieces and the seams should be staggered. 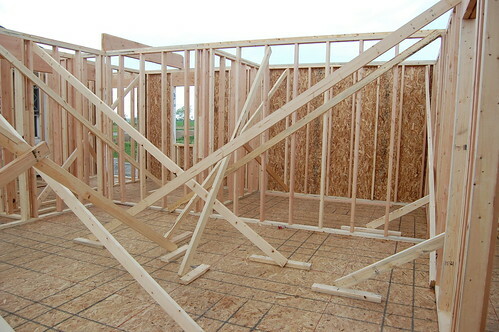 For more specific information on floor and wall framing, check out this post. For a person who runs screaming from math like yours truly, creating the roof structure is the most complicated part of framing. Luckily someone invented prefabbed trusses, but there are still things like slope and drainage to consider, along with the possibility of falling from an unfortunate height. Roof framing consists 2x lumber that supports the sheathing and shingles. Common roof styles include: Gable, hit, mansard, gambrel, saltbox, and shed. The roof should be “engineered” by a certified structural engineer. Notches or holes should never be cut in the boards of a roof system. 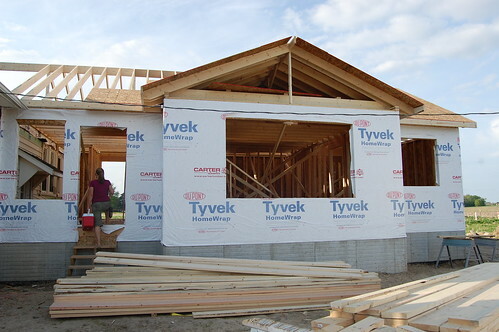 Like exterior wall sheathing, roof sheathing is most commonly OSB or plywood , but the minimum thickness will be determined by the truss or rafter spacing. 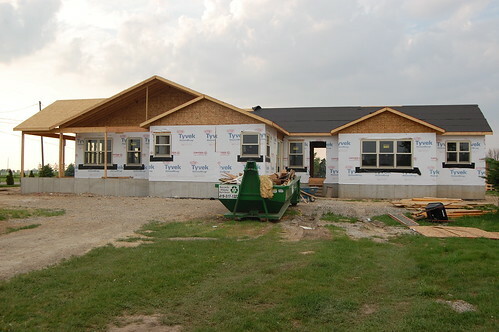 After the exterior wall sheathing is in place, a vapor barrier or “house wrap” is installed which prevents moisture from reaching the wood structure (but allows any moisture that does find its way in to leave). The first sheet of house wrap is started on the bottom (and run horizontally). Each row overlaps the previous by 3″. 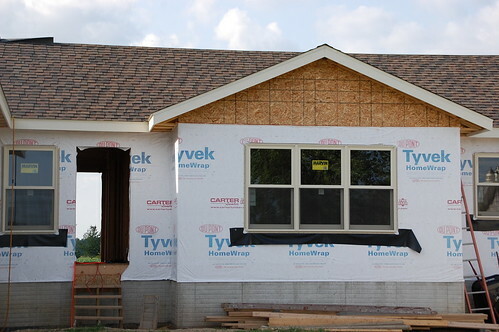 Once the house wrap has been secured the seams are taped. “Mechanical” generally refers to the HVAC system that circulates air throughout the house. It includes a furnace, air conditioner, vents, duct work, etc. It may also include any necessary gas piping. Proper placement of vents is important to even heating and cooling of the house. There is a maximum distance vents (like the clothes dryer vent) can travel. Unless you’re doing most of the work yourself– ahem– it’s likely that things like window and door installation will be going on simultaneously with the rough utilities. If you want to use a fancy word for it, door and window systems are referred to as the fenestration of a home, but not ever by me. All exterior doors must be a minimum of 1-3/4″ thick and should have a passage lockset as well as a deadbolt lockset with a minimum 1″ throw. The roof is by far the most important part of keeping the weather outside of the structure, and carrying water safely away from the walls and foundation. Roofing systems may be metal sheets or shingles made from asphalt, wood, slate, or fiberglass. Roofing systems include drip edge (a metal strip that runs the perimeter of the roof), tar paper underlayment, possible ice guard, and shingles. Roof pitch is measured by a number over 12, for example “4:12″, which the slope of the roof is 4 feet vertical for every 12 feet horizontal. For a roof with a pitch of 4:12 or greater, one layer of underlayment can be used. For a roof with a pitch between 2:12 and 4:12, two layers of underlayment are necessary. For shingle roofs, all fasteners must be galvanized with a broad flat head, and long enough to extend all the way through the shingle and the roof sheathing. The number of choices you have on materials to use on your house increases exponentially when talking about siding. Brick, wood, stone, vinyl, and fiber-cement are just a few siding options. Personally I prefer wood that has to be hand nailed with impossible to find stainless steel fasteners, but that’s just me. Full brick or stone siding must be supported by a brick-ledge in the foundation. Veneer brick or stone does not. Wood or vinyl siding must be attached in a way that allows it to expand and contract as the temperature changes. Interior insulation can be done any time after the doors and windows are installed, the roof is complete, and the utilities are roughed in. The amount of insulation needed in the exterior structure is determined by the energy codes. Effectiveness of insulation is measured by “R-value”. Insulation on the interior of the structure is used for soundproofing. Insulation types include fiberglass batts (faced and unfaced), foam board, spray foam, loose cellulose or fiberglass fill. While drywall might just seem like something to be painted pretty colors and hang pictures on, it also provides insulation and fire resistance. “Drywall” is composed of gypsum board panels, tape for the seams, and joint compound to cover seams and texture the walls. 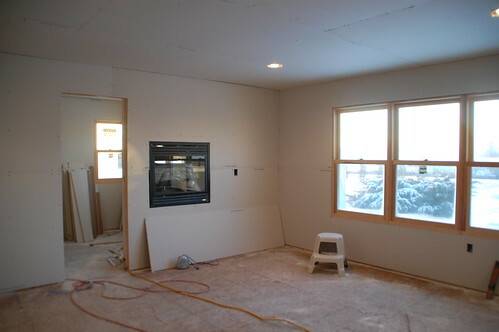 Generally 1/2″ drywall is used on walls. In some states (like my very own Michigan) you need to use 3/4″ drywall on the wall between the house and an attached garage for fire rating. 5/8″ boards are also recommended, but not required, for ceilings. Wallboard is attached to studs first using coarse threaded screws or nails, starting with the ceiling and working down the wall. Drywall seams are staggered similar to exterior sheathing. After wallboard is in place seams are taped and finished with joint compound. When seams are dry the wall may be textured with joint compound using rollers or drywall knifes. 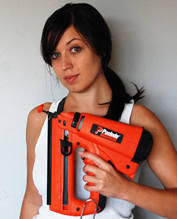 Get more detailed information and step-by-step directions on drywalling here. Wall paints generally come in latex or oil based. You can use a latex paint over an oil based primer. Typically oil based paints have a higher VOC level and are more difficult to clean, but are very durable and have great coverage. All drywall should be finished with a primer before painting, unless you’re using a paint and primer in one. 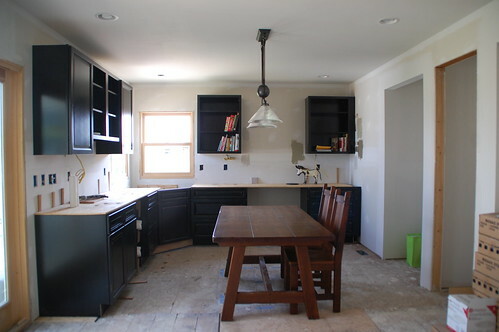 If you can manage it, it’s easiest to paint before trim, cabinets, and flooring are installed. 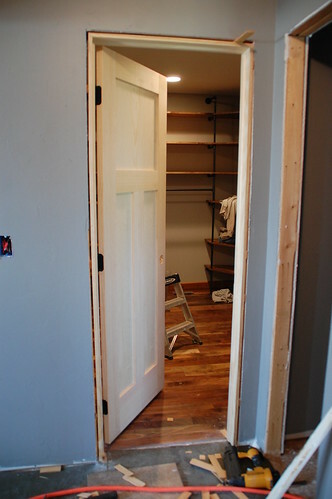 Once the paint is one the walls it’s time to start finishing things out with interior doors, and other interior carpentry such as handrails and built-in shelving. Interior doors typically come pre-hung in a frame and are 1-3/8″ thick and 80″ high. There are many style options from slab to mission to six-panel design. Doors widths are usually designated by foot-inches, so a 3-0 door is three feet or 36″ wide. Cabinets can be ordered to fit, or custom built in place for kitchens, bathrooms and other storage areas. Blocking for cabinets can be installed during wall framing to make the cabinet installation easier. Measuring for cabinets should be done after drywall is in place to ensure cabinet sizes are correct. Standard wall cabinets are 12″ deep, but vary in height. 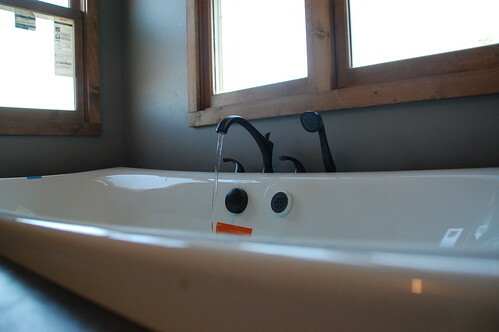 Bathroom base cabinets may only be 29″ high. For more information on blocking for cabinets, check out this post, and for building a bathroom vanity from scratch, check out this one. Sheet flooring such as wood, ceramic or vinyl may be installed at this stage, while carpeting is generally installed later. 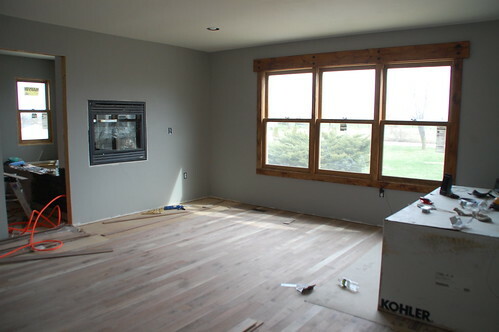 Most floors require some kind of underlayment between the subfloor and finished flooring. Wood flooring generally requires an underlayment rosin paper or roofing tar paper. Laminate may require a special underlayment to pad the floor and prevent squeaking. Vinyl flooring can be installed directly on a smooth plywood subfloor. Tile floor should be installed over at least 1/4″ durock or other cement board underlayment. For more information on wood floor installation check out this post, or tile installation try this one. 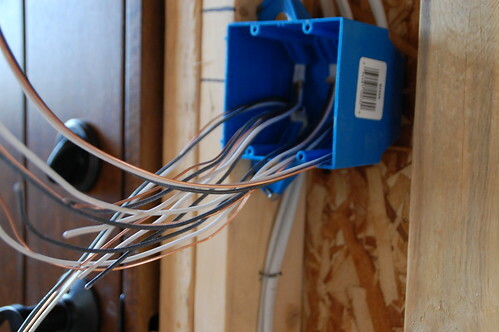 In order for all of those fun pipes and wires hidden in your walls to do their job, the electrical, plumbing, and mechanical work needs to be finalized. Electrical receptacles, switches, and light fixtures will be installed. Vent grills and thermostats for the HVAC system are installed. If you’re having carpeting installed it should be the absolute last thing that goes into your house. Unless you want to be vacuuming up construction dust for the rest of eternity, that is. Tack strips are installed around the perimeter of the room. Padding is used underneath carpet, and then carpeting is rolled out, stretched and attached to tack strips. The rough edge is tucked under the baseboard. After the final utilities are in place, inspections are performed on the structure, electrical, mechanical, and plumbing systems in order to obtain a certificate of occupancy. You win. Go get your stuff and move into that damn house already. Or if you’re me… sell it and start building a new one. Seriously Katy, the last line of the post was (Did that really take the last two years of my life?) Then I thought that might be depressing for everyone else… lol. What a wonderful post! Thank you for compiling all of this information into a relatively succinct and easy to understand construction timeline. Good luck with your next project, in life and construction. Great article,Kit! I was able to identify many of the items to things I did with Habitat and part of me wants to go visit the site manager to see if we did all of those things since I was only onsite on the weekends. I do know I wish we’d used screws with the sheet rock instead of nails since a few are popping out. Time to slam, patch & paint? We did a couple things to gain the “Energy Star Efficient” rating on the houses. One was some type of foam board on the outside in addition to the Tyvek (don’t remember under or over)and these two combined have really helped with heating oil usage. I’ve still got just under 3/4 tank and my last fill was last May. We dropped into the 30s for a few nights here in CT and inside WITHOUT the heat turned on, the temp only dropped to 64!And the other was inside, where the spaces between the sheathing were “a bit” more than 1/8″, we caulked. I looked much like a mummy when I was done with that! Just thoughts for your next home! Oh, and the seams on the foam board were taped as well as the Tyvek seams! Wow! I’m getting involved with Habitat for Humanity, and this is a ridiculously useful overview of what, I believe, I can expect when I work on some of their ground-up projects!! I might have to print it out and share with other H4H newbies. I hope you do a final house tour before you move! It has been so fascinating seeing the whole building process and how much a person can do on their own. I can’t wait to see what you do next! It is so neat to see this construction timeline laid out so nicely. We are currently building our country dream home using a carpenter as a consultant but doing the majority of the work ourselves (“ourselves” being my husband and I). It is a great solution to wanting to do it ourselves and ensuring all the math is correct (wow, is there a lot of math to figure out everything) and that the process of getting it donw is correct. We are so thankful for our consultant and thrilled to be building ourselves. Stop by for a visit, if you want. We are currently working on the second floor interior walls and hope to finish those up this week. When you are building the garage do you put up the garage door yourself or hire someone? I know as part of a local Phoenix garage door repair company that the garage door springs can be incredibly dangerous. I am looking for prefabricated bunglow at low coast but it must have good strenth and last long life. This is an awesome article! Extremely informative. 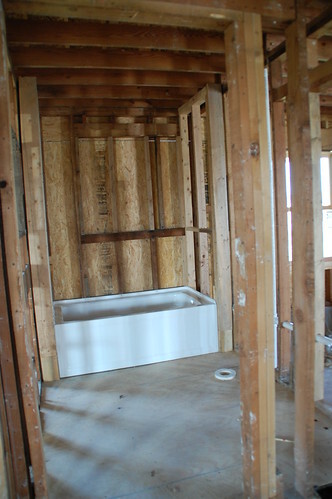 When building a home, it is important that no water damage or mold occurs. That would be a tragic experience in building your dream home! If you do discover mold or water damage, it is extremely important to contact a professional mold remediation company to contain it before it is too late! This post is so helpful. We’re starting the process of building a house from the ground up and really feel clueless about where to begin. Would you be willing to share any of the cost details with me? We’re trying to determine a price per square foot to be able to choose the size of house we want. If it’s $75/sf versus $100/sf, that’s a big difference. Hey Stephanie. Since we built (and paid) for things piecemeal, it’s really hard to say what the price/sf was. We individually priced out the “must haves” (framing, roof, heat, water, counters) and made sure we could pay for all of those, then figured we could save up for flooring, fixtures, etc. if we needed to. Good luck with your house! It will be an adventure. Building a house definitely takes a lot of work. Keep up the good work! I would like to ask the exact height of the blocking for the kitchen cabinetry. Great post! Very detailed. I am going to share this with my home remodeling customers in Rochester, NY. are formed and eventually these loops cut off the river, forming lake-type bodies of water adjacent to the main river. particular Company-controlled Leader, exonerates Lincoln as well as Sara. main roof surfaces. But not just on any given day; it is the amount of snow (weight) that might be expected to occur on the ground, say, once in fifty years. Hi to every one, for the reason that I am truly keen of reading this weblog’s post to be updated daily. This is so awesome! I’d love to make an addition to my home. I love the house, but there just isn’t enough room for our family anymore. I’ll definitely have to check the zoning information though, thanks for that reminder! Wouldn’t want to add to my house and then find out I’d accidentally built somewhere that wasn’t my property. Wow, good for you! I’ve been wanting to build an extension onto my house for years. We love our house, but it’s simply not big enough for me, my husband and our 6 kids anymore. You mentioned that roper placement of vents is important to even heating and cooling of the house. How do you know where to place vents? Does anyone have experience with any web sites to help maintain your home? I’ve started my own Excel spreadsheet to help with the process but it seems like there should be a better way. I found a couple web sites that seem to offer some help and wondered if anyone knows of others. The two I found are http://homeshape.com and https://www.houseup.com. I signed up for them both but I’m not sure which one to put my energy into because I have to add all my appliances and other things that need some sort of maintenance and that will take a little time. It looks like HomeShape offers the most help and actually locates owner’s manuals and other repair and maintenance information for you including a calendar where they schedule things like haz waste and yard collection dates. I like the house you showcase in this article. Where can I get the blue print for this house? good but what about knocking out wall between old and new and supporting old structure where hole is? I mean, that’s going to be 100% dependent on each particular case. (i.e. where the hole will be, size of the hole, what the load on that particular part of the structure will be, etc.) You’ll definitely have to put a beam in, but the size depends on all those other factors. 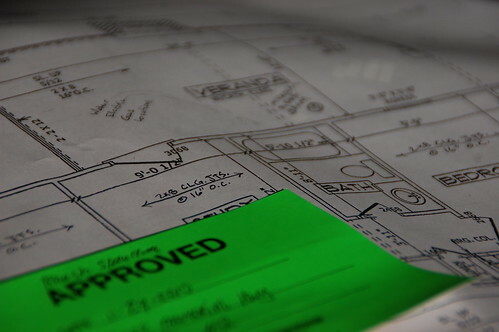 Even if you’re going to DIY the build it’s best to have an architect draw up the plans… they need to be approved by an engineer to make sure it’s structurally sound. 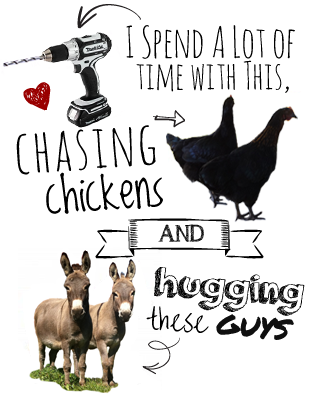 I love your post. Is there a way to a Gantt chart or sheet tat will explain with a schedule? This is a great breakdown. HVAC installs when the home is brand new is so much easier. It’s a good time now to get it right while the walls are all open. Very well explained, worthwhile and thorough, an actual inspiration. I’m in the landscaping business and I have to agree foundation prepare is flawless! I think you should be proud of what you did because building a house is a big deal. When you are done I’m sure you will be living in it with joy and you will know that you made it. The house will be the best one for you. This is very important! I tried leaving this on the next page but not sure it you seen it. 2 years ? Did it seriously take you that long ? Seriously? Did you do ever stage by your self or did your crew give you a hand? Here’s what I left on the other page. Hey I’ll will be building my house pretty soon and have some questions for you. So what work did you do your self and what trades did you sub out ? Can you list the trades you sub out and what each one cost at the time? What is the Square foot of this house ? How much was the total cost in materials ? 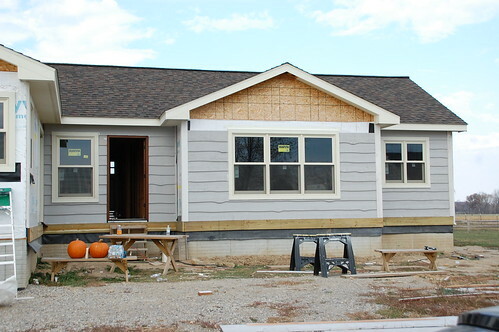 What inspections needed to accrue through what stages of the build to continue moving forward? How long from the first day of breaking ground did it take to get the approval to occupie the home? – We subbed out the foundation, main rough framing, drywall, and the plumbing/HVAC. 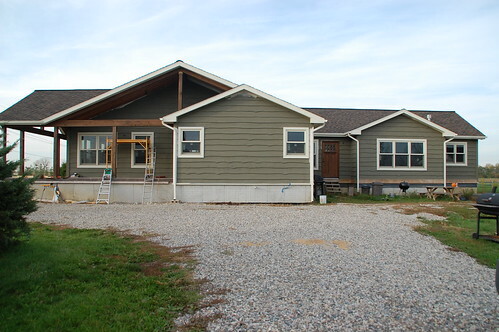 We did the roof, siding, drywall finishing, electrical, flooring, tiling, and all trim work (interior and exterior). I don’t have costs for those, and it will vary greatly by your area and the materials you use. – The house was around 2000 SF. – There’s no good way to calculate total cost of materials because of the way we built the house. Look up a good construction estimating calculator online for a sense of cost by SF for construction. – Inspections will vary by location, but we had to get the initial permit/approval to build, and then the electrical/plumbing/HVAC/structural inspections before closing up the walls. After the work was complete (18 months or so) we got the final inspection. After study a few of the blog posts on your web site now, and I truly like your method of blogging. I bookmarked it to my bookmark website record and can be checking again soon. Pls check out my website as effectively and let me know what you think. Wow Kit, that is an amazing job. 2,000 square feet is no small task and I’m not surprised it took you a total of 2 years. It really is a great project though, more than worth it! your RSS feed to my Google account. I look forward to fresh updates and will talk about this site with my Facebook group. Great article! The house looks nice and the whole project detail is very professional.